The Solent Way is a 60-mile long-distance coastal walking route from the seaside town of Milford-on-Sea finishing at Emsworth Harbour. The route is waymarked with a Tern on a green arrow and is shown on Ordnance Survey maps Explorer OL22, 119 and 120 at 1:25 000 scale and indicated on these maps with a green diamond and the name of the route (Solent Way). Starting at Lee on the Solent you can follow the Solent Way along the shore line to Stokes Bay and Gilkicker Point (5.7km/3.5miles). On the way you will pass Browndown ranges, which is an unusual shingle habitat that has been used for military training for more than 300 years, and is still used as a firing range today. Browndown Battery (built in 1888) is situated in the army training camp. Historic features around Stokes Bay include No. 2 Battery which now houses the Historic Diving Museum and is open to the public during the Summer months. The Solent Way runs along the length of Stokes Bay from No.2 battery to Fort Gilkicker, passing the sites of the D-Day hards, the D-Day Command centre, which is now the home to the Gosport Sailing Club, and the site of the old Stokes Bay pier and the School of Electric Lighting. At the east end of Stokes Bay you pass Fort Gilkicker, a Victorian Coast Defence Battery built as part of Lord Palmerston’s great defence plan for the united kingdom in 1858, that turned Portsmouth into one of the mostly strongly defended places in the world. From there you turn north past the the salt lagoon from the foreshore of Gilkicker Point, which is a Site of Special Scientific Interest, a haven for wildlife. From 1 January 2012, the Defence Infrastructure Organisation have withdrawn all permissive rights to walk along the foreshore for the Solent Way at Browndown near Gosport. 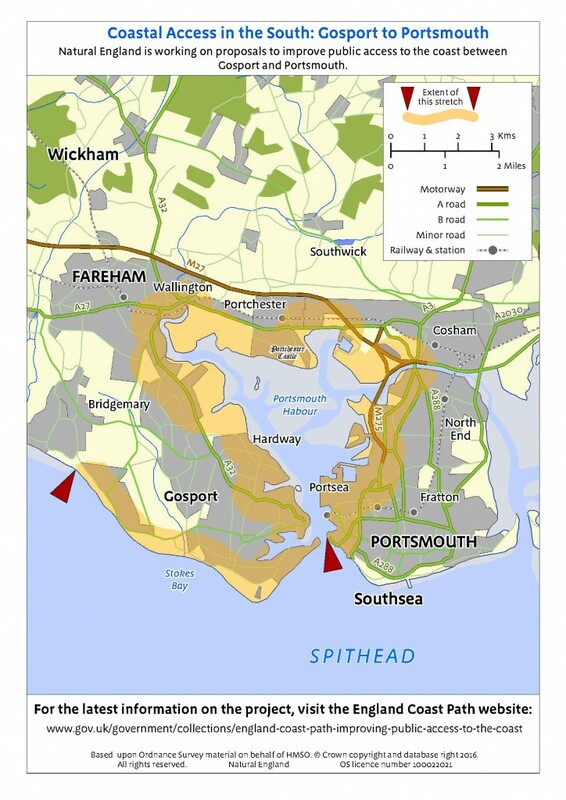 Natural England has begun to investigate how to improve coastal access along a 46km stretch of the Hampshire coast between Gosport and Portsmouth. This new access is expected to be ready in November 2018. The proposals will be finalised and then published in a report to the Secretary of State for the Environment, Food and Rural Affairs. This is expected to take place in Autumn 2017. Once published, the report will be available on GOV.UK and advertised in the local press.